In this post we will learn about one more wrapper from Kendo UI library called Calendar. If you are starting new on Kendo UI, make sure to go through the blog post – Jump starting Development with Kendo UI for ASP.NET MVC. 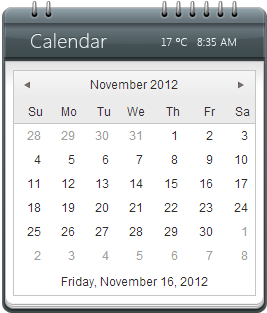 We will look at the usage of the Calendar widget and how to program the Calendar widget. If you are looking for the index post on this getting started series, click here. 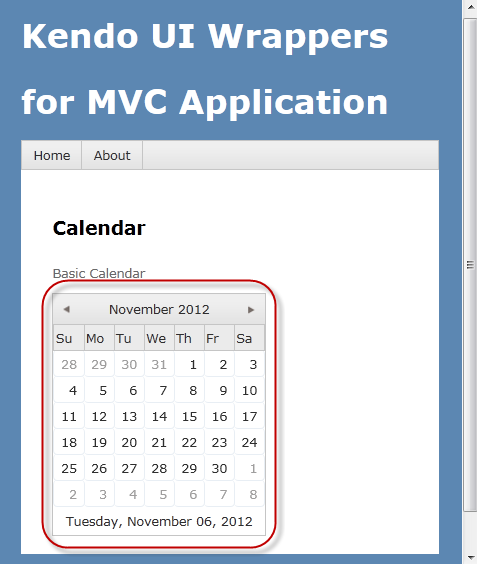 To follow this blog post, just create a “C# Kendo UI for MVC Web Application” project type and work along. 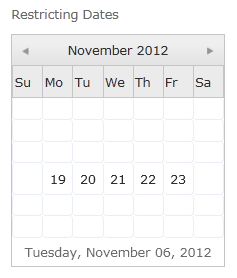 The Calendar Widget renders a graphical calendar that supports navigation and selection. It supports custom templates for its “month” view, configurable options for a minimum and maximum date, start view and the depth of the navigation. 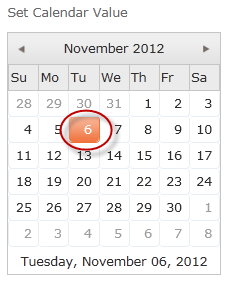 That’s it – with just one line of code we have a Calendar on our page. Next lets see how we can control the Calendar View. As you can see it does not show the dates outside of the allowed Min and Max date settings. Navigate – occurs when any navigation is performed by the user i.e. month change, year change etc. Similarly you can handle the Navigate event also.